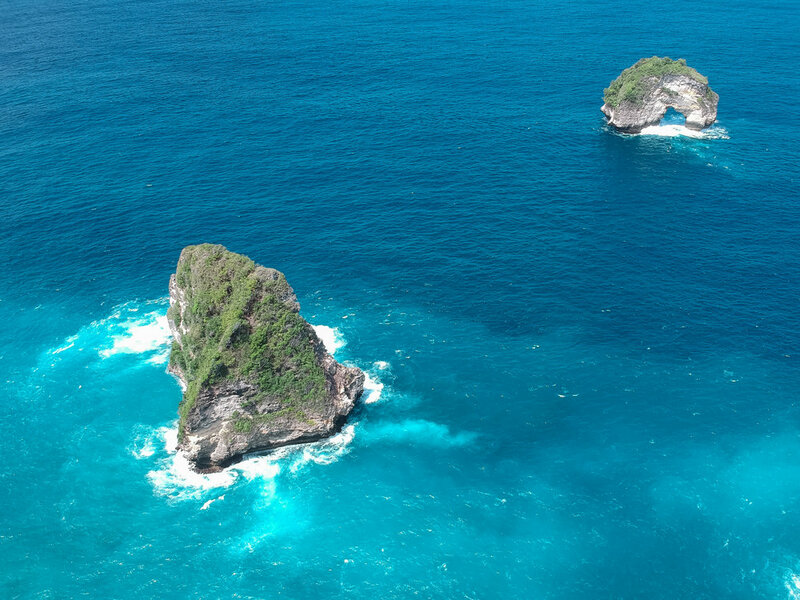 Nusa Penida is Bali's wild, more adventurous cousin. It has some of the most beautifully unique landscapes in the world but also treacherous roads and hundreds of stairs to get to them. Every single day here left us breathless (both literally and figuratively) and has remained our number one favorite place to visit in our 6 months in Bali. Also known as "T-Rex beach" due to the shape of the coastline, this place is even more beautiful than any photos can depict. The surrounding cliffs offer stunning aerial views of this beach, and if you're feeling brave you can even make the treacherous climb down to the beach itself. Few tourists make their way down, so a gorgeous empty beach awaits at the bottom! Read our guide to visiting this beach here. 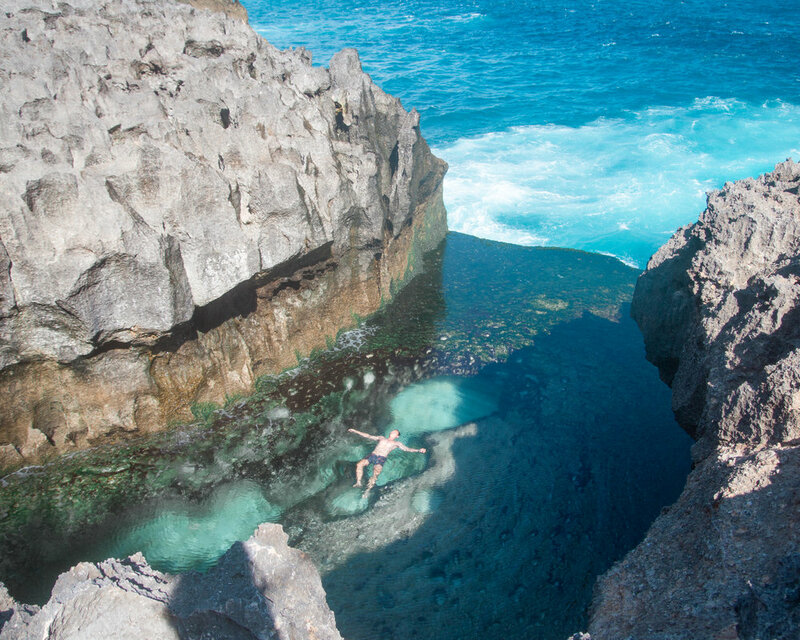 Angel's Billabong is a tide pool where crystal clear waters overflow directly into the ocean, creating "nature's infinity pool". On occasion a large wave crashes into the cove and refills the tidepool. Don't be an average tourist and only take photos from the top. Instead climb down into the pool for a relaxing float, just make sure to watch your back! Check out our guide to Angel's Billabong here. Right next door to Angel's Billabong is another wonder of nature: Broken Beach. An archway in the cliffside allows water to pour into this completely encircled beach. While there is no way to get down to the beach itself, it's still a breathtaking viewpoint you shouldn't miss. See our guide to visiting Broken Beach here. This west-facing bay not only offers wonderful snorkeling, but also has some of the most beautiful sunsets due to the unique rock in the center of the water. 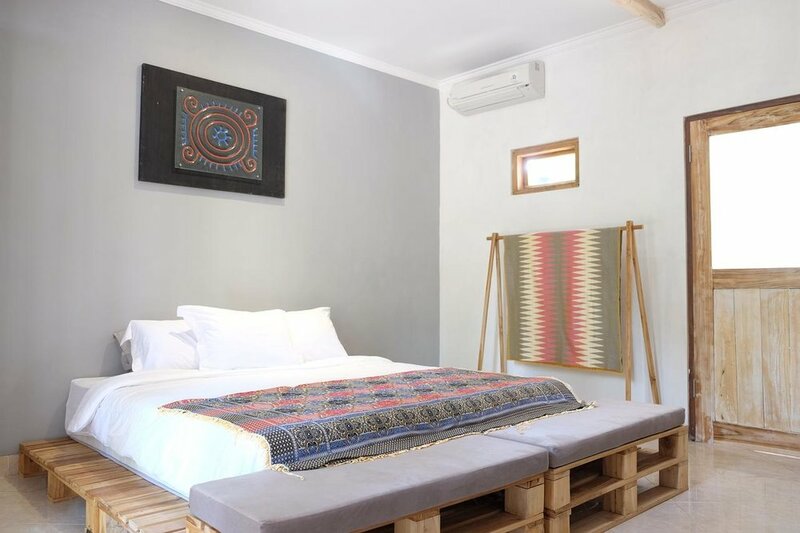 This is a perfect spot to grab some Bintang beers and wind down at the end of an action-packed day. Read our guide to this sunset spot here. With insane coastlines and turquoise waters, these are two of the most beautiful beaches we've ever seen! Both are located on the east side of Nusa Penida, separated only by a few hundred stairs. Note at the time of writing, the steps down to diamond beach haven't entirely been finished but some have found a way to sketchily make their way down. View our guide to visiting these beaches here. 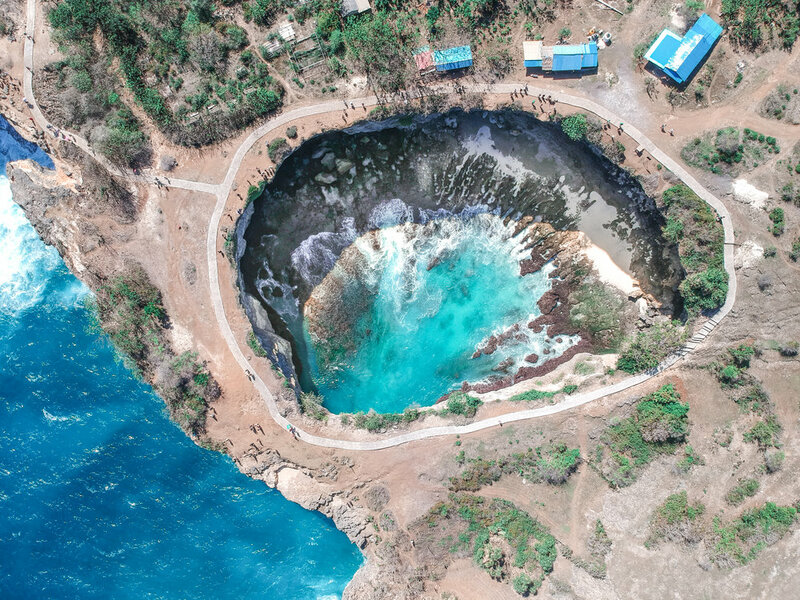 These are two of Nusa Penida's most beautiful viewpoints and are located in the same area within 5 minutes of each other. Each offers a stunning east-facing view of epic rock formations (the thousand islands) and deep turquoise waters. If you feel like roughing it you can even stay in the treehouse overnight and wake up to one of the most epic sunrises you will ever see. View our full guide to visiting Rumah Pohon & Thousand Island Viewpoint here. This was one of the most memorable experiences in our whole time in Indonesia! There are dozens of operators offering manta snorkeling and diving tours in Nusa Penida. They leave every morning and last roughly 3-4 hours. The mantas can get up to 23 feet wide but are totally harmless and even playful towards humans! See our guide and video on snorkeling with these majestic creatures here. This peaceful natural pool is located in the middle of Tembeling forest. There are inner tubes to float on or you can even climb the overhanging rock face for a mini cliff jump into the deep pool below. Read our full guide on this small oasis here. If after all of these sites you're still hungry for more dramatic coastlines and blue waters, check out this lesser known viewpoint. After walking through some bushes and climbing down a secret stairway, prepare to be stunned once again by Nusa Penida's natural beauty. For more details on this viewpoint check here. 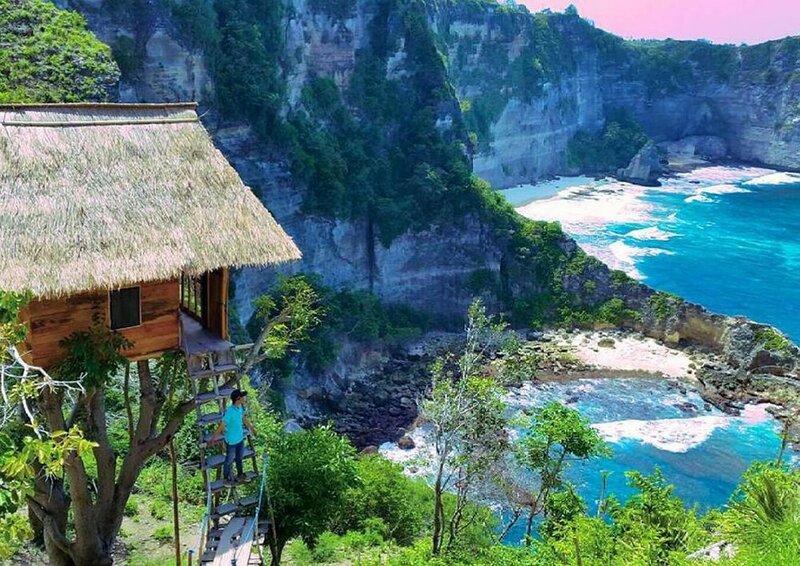 As you climb down the iconic, steep blue stairs to Peguyangan you are treated with remarkable views of the coastline. At the bottom you won't exactly find a waterfall but rather several water spouts and rock pools. This is a religious site, so you may see locals praying and bathing in the spring as a way of receiving blessings. We skipped this one since we were enjoying chilling at Atuh beach too much but we plan to go the next time we're in Penida! Unfortunately we weren't able to visit Suwehan beach due to a landslide blocking the stairs down. This beautiful secluded beach has a large triangular stone in the middle of the water, reminiscent of the beaches you may find in the Philippines or Thailand. Check Tripadvisor and ask around to see if it has reopened. We booked our boat to Nusa Penida with Maruti Express on Bali Fast Boats for about $20 USD each way. The boat leaves from Sanur 3 times a day and takes about 45 minutes to arrive in Nusa Penida. Note that there is no dock on the Sanur end so you’ll have to wade through the ocean to climb in the boat. There are also several other boat companies at the port in Sanur so you might be able to get a cheaper price if you buy a ticket in person there. Scooter parking is available in Sanur for 2k for one day or 10k IDR for overnight as long as you like. 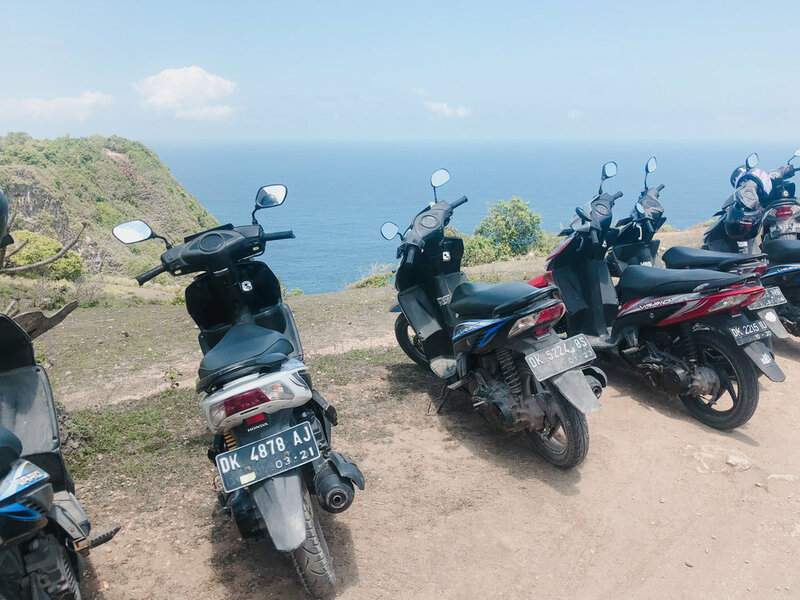 Renting a scooter is the cheapest and most flexible option in Nusa Penida. You can easily find a scooter immediately after getting off the boat for about 70k IDR per day. The one downside of this option is that roads are horrible. There are pot holes everywhere and unpaved gravel roads. There are small stretches of extremely steep inclines and declines where you may have to get off the scooter and push it. In addition, your rental scooter possibly won't be in the best shape and won't come with helmets. Our scooter didn't have a working gas gauge, resulting in us running out of gas and having to push our scooter uphill through a forest path. But it all adds to the adventure and honestly isn't as bad as it sounds! Hiring a driver will be a bit more expensive, expect to pay around 700k IDR per day, but it's worth it for your safety if you aren't comfortable with driving scooters on these wild roads. Your driver will also know the best times to go to each site and may show you some secret spots as well. Penida Colada: Beach-side bar and restaurant with amazing tropical drinks. Check for their 2 for 1 happy hours! Warung Salt & Pepper: Super cheap, fast and delicious Indonesian food. We ended up eating here three times over 4 days. Warung Jungle: Extremely popular with the tourist crowd but tasty nonetheless! Come here for their prawn soup and large seafood platters. Modern bungalows with beautiful outdoor showers. Hosted by a wonderful family who can help you get a good deal on the manta ray snorkeling tours! The insta-famous treehouse with amazing sunrise views. Note these are extremely basic accommodations and you may have many tourists on your front steps taking photos throughout the day. Luxury bamboo bungalows with epic Nusa Penida views and an infinity pool. Currently one of the nicer accommodations on this up and coming island.